CooperVision has a wide variety of lenses to choose from. While they still carry many conventional lenses for those who want a traditional yearly replacement lens, they also have many new technological advances in contact lenses such as their silicone hydrogel lenses and toric Multifocal lenses. CooperVision has a number of new contact lens designs available for just about every type of prescription. This new member of the Biofinity family is designed for people who are using mobile devices and computers frequently. It has a "digital zone optics" lens design that eases eye strain that is associated with computer use. The use of computers and digital devices causes people to stare at their device or computer screen, which dries the eyes. The aqua form technology that this lens uses allows the eyes to remain moist for a longer period of time. This is a daily disposable contact lens made of silicone hydrogel. This material allows a high percentage of oxygen to the eye, which allows for better health. CooperVision's new daily disposable Clarity lens is available for people who are nearsighted, farsighted, those with astigmatism, and those who need bifocals or reading glasses. It also provides some protection from UV light. Another daily disposable lens, My Day is a silicone hydrogel contact lens that provides exceptional comfort as well as superior handling. Proclear 1 Day - A daily disposable contact lens with excellent comfort. The Proclear 1Day design attracts water for a moist and comfortable lens. Made from 60% water and available in 30 and 90 packs. Proclear sphere - A monthly disposable lens aimed at people with dry eyes. Not a silicone lens, but high in water content for excellent breathability. Available in two base curves. Proclear Toric - The same Proclear design but made for those who have astigmatism in their prescription. Many people prefer the comfort of Proclear Toric over other toric lenses. Available in two base curves. Proclear Toric XR - The same Proclear design for astigmatism but in an extended range for those with high prescriptions and/or higher amounts of astigmatism. These lenses will be more expensive, as they are custom made. Proclear EP - This lens is made from the same material as Proclear sphere, but includes correction for those who are new to wearing bifocals. EP, or early presbyope, is for people in their 40's who are just starting to notice that reading close up is getting difficult. Please see our section on Multifocal contact lenses. Proclear Multifocal - The same comfort and vision of Proclear as well as clear vision at all distances for those who need a bifocal. Pleases see our section on multifocal contact lenses. Proclear Multifocal XR - A Proclear monthly contact lens for those who need a bifocal and have a higher prescription. Proclear Multifocal Toric - The first monthly replacement Toric contact lens for astigmatism to also include vision for those who need a bifocal. Please see our page on multifocal contact lenses. Biomedics - These lenses are the same as Ultraflex. Biomedics 1 Day Toric - A one day disposable lens made for those who have astigmatism in their prescription. 55% water and available in 30 packs only. Biomedics 38 - A two week replacement lens with 38% water content. Biomedics XC - A two week replacement lens, uses technology that attracts water to keep lenses moist and comfortable. Biomedics Toric - Biomedics design and material with astigmatism correction. Ultraflex - These lenses are the same as Biomedics. Ultraflex 1 Day - A daily disposable lens with UV protection*. Made from 55% water and available in 30 and 90 packs. Ultraflex 38 - A two week replacement lens with 38% water content. Ultraflex XC - This lens is monthly replacement, and contains 60% water. Ultraflex Toric - The Ultraflex design and material, made for those who have astigmatism. Biofinity - These lenses are also known as Harmony. Biofinity - A monthly placement contact lens made from silicone hydrogel. The material is naturally wettable, and is very breathable. Approved for extended wear. Please see our section on extended wear contact lenses if you are interested in sleeping in your contact lenses overnight. 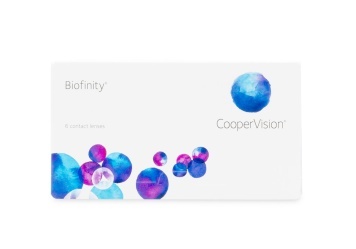 Biofinity Toric - The same monthly replacement lens as above, but made for those who have astigmatism in their prescription. Their design of lens gives very stable vision, and most find the lens very comfortable. Biofinity Multifocal - For those who need a bifocal, this lens provides the same comfort and breathability of other Biofinity lenses. Encore 100 - A monthly replacement contact lens also made form silicone hydrogel. Not approved for overnight wear, so must be removed prior to sleeping. Encore 100 Toric - The same comfort of Encore 100 in a lens designed for those who have astigmatism in their prescription. Encore Sphere - Also known as Vertex in the U.S., this is a comfortable monthly replacement contact lens. *As of Oct. 31, 2016, the CV Encore Sphere has been discontinued by CooperVision. Encore Toric - A monthly replacement contact lens for those who have astigmatism in their prescription. Also known as Vertex Toric. 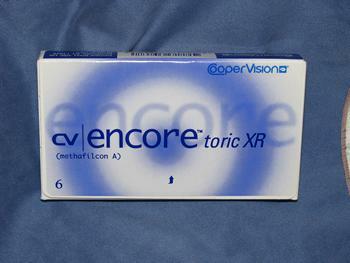 Encore Toric XR - A monthly replacement contact lens for astigmatism, with extended ranges available. Also known as Vertex Toric XR. Frequency 55 sphere - This is a monthly replacement lens that has good comfort and excellent handling. *As of Oct. 31, 2016, the Frequency 55 sphere has been discontinued by CooperVision. Frequency 55 Aspheric - An aspheric lens gives you better, crisper vision. Also monthly replacement, made from 55% water. Frequency 55 Toric - This lens is made from the same material as other Frequency lenses, but includes vision correction for those with astigmatism. Frequency 55 Toric XR - The same lens as above, but in an extended range for those with a high prescription or a high degree of astigmatism. Expressions Colors - These are coloured contact lenses made for people with dark eyes. CooperVision uses a technologically advanced tinting process that produces colour changes that are more natural. There are eight colours to choose from: aqua, blue, blue topaz, brown, gray, green, hazel, and jade. Preference FW - Preference lenses are made for a quarterly replacement schedule. In other words, they are meant to be worn for up to 3 months. The Preference FW is a flexible wear design, which means that it is thinner, with more water content to breathe better, and can be slept in occasionally. Please see our section on extended wear lenses if you are interested in sleeping in your contact lenses. Preference DW - The DW version of Preference lenses is made for daily wear only. They must be removed prior to sleeping, and removed after approximately 8-12 hours. They are also quarterly replacement. These lenses are thicker than the FW version, and provide very good handling. Preference Toric - For those wanting quarterly replacement lenses and have astigmatism in their prescription. Preference Toric XR - This is an extended range of Preference Toric, for those with a higher amount of astigmatism. Hydrasoft Standard - This is a conventional daily wear contact lens with a wide variety of sizes available. Hydrasoft Toric DW/XW Division I Standard - A conventional daily wear lens for those with astigmatism and standard powers available. Hydrasoft Toric DW/XW Division II Specialty - Also a conventional daily wear lens for those with a higher degree of astigmatism, and higher strength of prescription. Hydrasoft Toric DW/XW Division III Custom - A custom made conventional daily wear contact lens for those with prescriptions outside the normal range. If you thought you couldn't wear contact lenses because of your prescription, you could try these lenses from your eye care professional. Hydrasoft Toric DW/XW Division III Aphakic - This is a custom daily wear lens that CooperVision makes for those who have a high plus prescription. Avaira - This lens is not available in Canada, but is available in the United States. It is made of naturally wettable silicone hydrogel with UV protection. * This is a two week replacement lens made for people who need comfort all day long. These products were discontinued as of November 1, 2010. If you currently wear any of these lenses, you must see your eye care practitioner to be refitted into another lens. As of October 31, 2016 there are two more lenses that CooperVision has discontinued: the CV Encore Sphere and the Frequency 55 Sphere. * UV absorbing contact lenses are not substitutes for sunglasses which also protect the surrounding areas of your eyes. Please see our section on sunglasses.